Chattanooga School of Language Founder Laurie Stevens, center, receives $20,000 grant from Tennessee Valley Federal Credit Union President Todd Fortner, right, and vice president Tommy Nix, left, after she was picked at the top winner in the Idea Leap contest for small businesses. A foreign language school that has grown over the past seven years from teaching three to 17 languages was picked tonight as the top winner from among more than 200 small businesses that applied for one of the new Idea Leap grants from Chattanooga's biggest credit union. 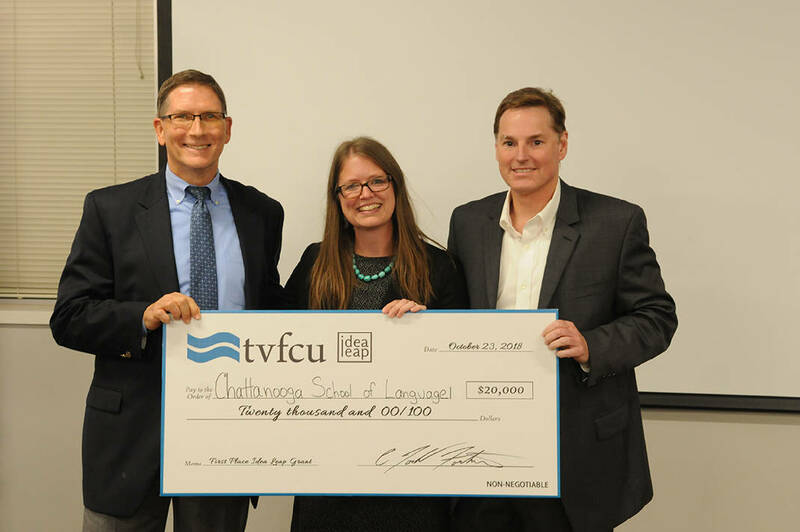 The Chattanooga School of Language, which Laurie Stevens began in 2011, received the top $20,000 prize from Tennessee Valley Federal Credit Union (TVFCU) after a panel of judges selected the language school as the most promising growing small business for the new grant. Stephens, who has grown her language school to include 40 part-time language instructors teaching an array of courses, said the extra funds will help her to recruit and retain even more teachers and to add more online course instruction and options to meet the growing international communication needs of Chattanooga. "The Chattanooga of 2018 is quite different from the Chattanooga of a decade ago," Stevens told those gathered at the Edney Building tonight to a pitch of the top 10 finalists for the new small business grant from TVFCU. "Now, as many as 75 different languages are spoken here in a community that represents many different backgrounds and cultures." 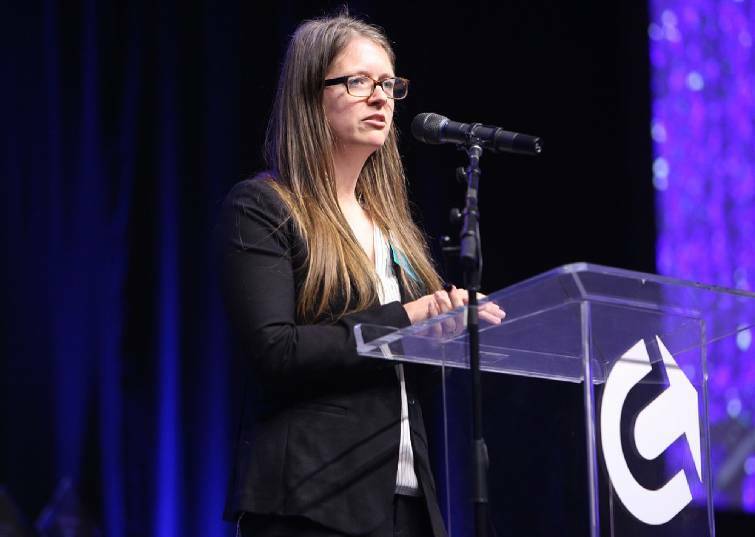 Since 2008, foreign-based companies have invested more than $6 billion into Southeast Tennessee "and entrepreneurs and innovators from around the world are choosing Chattanooga as their home," Stevens said. As a result, Stevens said she was unable to meet all of the demands for language training at her school this fall. From its office on Access Road in Hixson, the Chattanooga School of Language offers a variety of classroom settings, flexible schedules and cultural activities to help educate students of all ages in different languages. In her pitch tonight for the Idea Leap grant, Sevens said Chattanooga "is failing to prioritize and develop" language and cultural diversity and proficiency to compete for talent and business in a global economy. In Hamilton County's 48 elementary schools, only four offer any foreign language instruction to students even though 50 different languages are spoken in Chattanooga area schools, Stevens said. Chattanooga School for Language, which was also honored earlier this year as a winner of the Chattanooga Chamber of Commerce Small Business Award, grew its student enrollment in the past five years by 659 percent. "This year, I had to turn away potential clients because we didn't have enough teachers trained and available to teach," Stevens said. Stevens' language school was among 10 local small businesses that won prizes tonight from TVFCU's new Idea Leap grant program, which was funded by the credit union from proceeds it earned from 50 successful loans made on $1.4 million of Idea Leap loans to entrepreneurs who have successfully completed programs by Co.Lab., SCORE, the Tennessee Small Business Development Center and others. Other top winners from tonight's pitch competition included Dish'T Pass, a catering and recreational cooking school that won a $15,000 grant to begin an online, interactive cooking course, and Mad Priest Coffee, a coffee roasting and South Broad Street retailer which was awarded $10,000 to open a new production site. TVFCU also gave $2,500 grants to the Hot Chocolatier and LoAdebar, and awarded $500 grants to Cashew, Dipped Fresh, Skye Strategies, Locals Only Gifts & Goods and Inspire Chiropractic. The 10 finalists who presented their business pitches tonight as a part of Startup Week in Chattanooga were picked from among more than 200 initial applicants to TVFCU's new grant program for small businesses. "We're cooperatively owned and this is a great way for us to give back to our community and to help promote the growth of startup businesses which help our community grow," TVFCU President Todd Fortner said.